Researchers from the Graphene Flagship use layered materials to create an all-electrical quantum light emitting diodes (LED) with single-photon emission. These LEDs have potential as on-chip photon sources in quantum information applications. Atomically thin LEDs emitting one photon at a time have been developed by researchers from the Graphene Flagship. Constructed of layers of atomically thin materials, including transition metal dichalcogenides (TMDs), graphene, and boron nitride, the ultra-thin LEDs showing all-electrical single photon generation could be excellent on-chip quantum light sources for a wide range of photonics applications for quantum communications and networks. The research, reported in Nature Communications, was led by the University of Cambridge, UK. The ultra-thin devices reported in the paper are constructed of thin layers of different layered materials, stacked together to form a heterostructure. Electrical current is injected into the device, tunnelling from single-layer graphene, through few-layer boron nitride acting as a tunnel barrier, and into the mono- or bi-layer TMD material, such as tungsten diselenide (WSe2), where electrons recombine with holes to emit single photons. At high currents, this recombination occurs across the whole surface of the device, while at low currents, the quantum behaviour is apparent and the recombination is concentrated in highly localised quantum emitters. All-electrical single photon emission is a key priority for integrated quantum optoelectronics. Typically, single photon generation relies on optical excitation and requires large-scale optical set-ups with lasers and precise alignment of optical components. This research brings on-chip single photon emission for quantum communication a step closer. Prof Mete Atatüre (Cavendish Laboratory, University of Cambridge, UK), co-author of the research, explains “Ultimately, in a scalable circuit, we need fully integrated devices that we can control by electrical impulses, instead of a laser that focuses on different segments of an integrated circuit. For quantum communication with single photons, and quantum networks between different nodes — for example, to couple qubits — we want to be able to just drive current, and get light out. 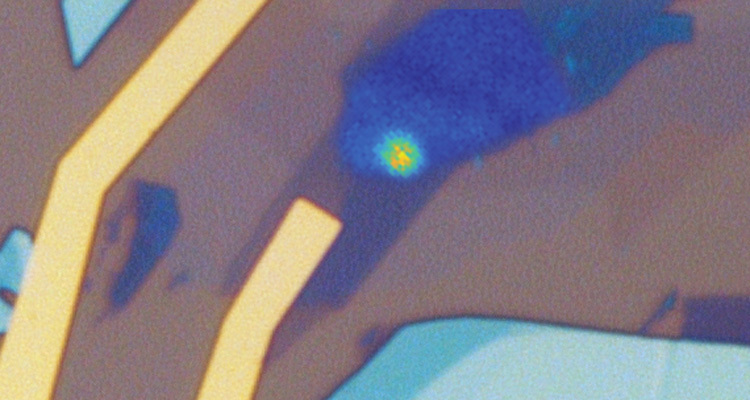 There are many emitters that are optically excitable, but only a handful are electrically driven” In their devices, a modest current of less than 1 µA ensures that the single-photon behaviour dominates the emission characteristics. This research is a fantastic example of the possibilities that can be opened up with new discoveries about materials. Quantum dots were discovered to exist in layered TMDs only very recently, with research published simultaneously in early 2015 by several different research groups including groups currently working within the Graphene Flagship. Dr Marek Potemski and co-workers working at CNRS (France) in collaboration with researchers at the University of Warsaw (Poland) discovered stable quantum emitters at the edges of WSe2 monolayers, displaying highly localised photoluminescence with single-photon emission characteristics. Prof Kis and colleagues working at ETH Zurich and EPFL (Switzerland) also observed single photon emitters with narrow linewidths in WSe2. At the same time, Prof van der Zant and colleagues from Delft University of Technology (Netherlands), working with researchers at the University of Münster (Germany) observed that the localised emitters in WSe2 are due to trapped excitons, and suggested that they originate from structural defects. These quantum emitters have the potential to supplant research into the more traditional quantum dot counterparts because of their numerous benefits of the ultrathin devices of the layered structures. web Source: Graphene Flagship. Original written by Sophia Lloyd.